Exclusive welcome bonus of up to $1000. Mac / Linux compatible Flash version. $100K Guaranteed Sundays w/ Rebuys. Great perks for VIP members. Plenty of NLHE and PLO traffic. Little action in Stud and Draw games. One of the most trusted bet facilitating brands in the UK, Ladbrokes Poker carries that reputation over into their online poker service. Boasting quick withdrawals, excellent player support, reliable security, and an exceptional online poker tournament selection, there is no mystery behind the rave reviews Ladbrokes Poker has received from their customers. Ladbrokes Poker regularly provides opportunities for patrons to win a seat in a variety of major live poker events, and offers first-time depositors up to $1000 in bonus cash (with Ladbrokes Poker bonus code: VIPBONUS). The loyalty rewards system benefits players of all stakes and frequency, and lavishes Ladbrokes Poker VIP members with personalized service and exclusive promotions. The Ladbrokes online poker room offers cross-platform accessibility, with an instant-play browser-based feature supplied in addition to the free PC download version. 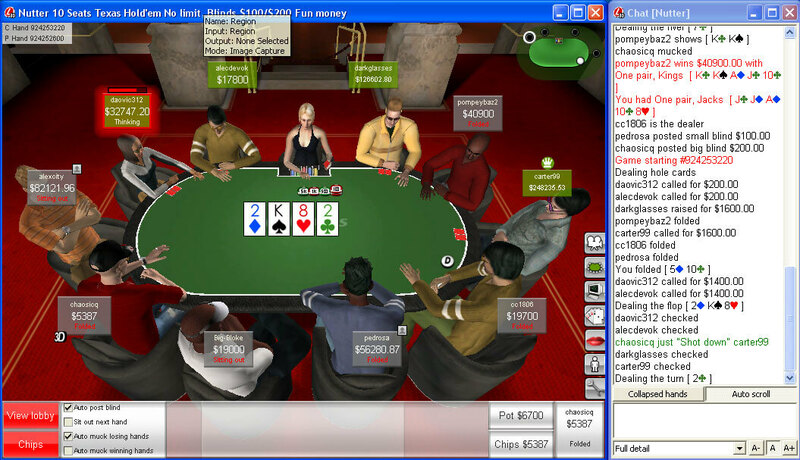 Overall, Ladbrokes Poker is a highly recommended choice for online poker tournaments, rewards, and promotions. Ladbrokes utilizes online poker software developed by the Microgaming Network, offering a secure and stable platform that is fully loaded with all of the latest features available. From the standard issue table options and lobby filters to virtually unlimited multi-tabling capabilities, the Ladbrokes software has everything an online poker player needs for exceptional game play; and a few things one may never have thought of. In addition, novice players will find a user-friendly navigational interface that places all of the necessities no more than a few clicks away. For ultimate flexibility and accessibility, aside from the Windows-compatible Ladbrokes Poker download, a platform independent instant play flash version of the Ladbrokes online poker software is also available for Mac, Linux and Windows users. As a partner of the Microgaming Network, Ladbrokes shares a player pool that reaches into the upper thousands at peak hours. The majority of the player traffic is predominately made up of casino, sportsbook, STT and MTT tournament players; though a significant amount of players keep the action going at the No Limit Texas Hold’em and Pot Limit Omaha cash tables round-the-clock. Offering over $3.8M in monthly guaranteed tournament prizes, Ladbrokes runs more than 30 guaranteed online poker tournaments every day. Daily guaranteed tournaments range from the $1+$0.10 $50 GTD Pot Limit Razz with rebuys every day from Monday thru Sunday, to the $100+$10 $10,000 GTD No Limit Hold’em held Monday thru Friday. On Sundays, tournament lovers can compete for a cut of the $100,000 GTD with rebuys, the monthly $200,000 GTD, or the quarterly $500,000 GTD two-day event. In addition to guaranteed prize tournaments, Ladbrokes also provides newcomers with several freeroll opportunities, leaderboards and points races for MTT and Sit and Go players, and progressive jackpots in both STT and MTT formats. 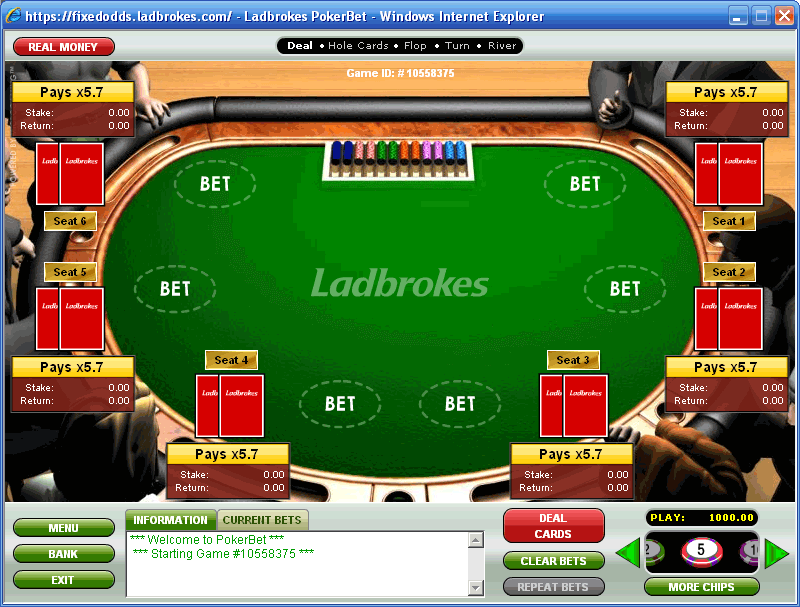 Players will find an extensive variety of poker forms available at Ladbrokes. Texas Hold’em, Omaha, Omaha Hi-Lo, and 7 Card Stud are obviously present, as well as rarer games such as Razz, 5 Card Stud and 5 Card Draw. However, finding any cash game action in the Stud and Draw variants is next to impossible. Players looking for soft competition are sure to find it at Ladbrokes Poker. Sharing the Microgaming Network’s player pool, loose play and juicy games can be found in the low to mid-stake cash games. The smaller buy-in daily Sit and Gos and MTTs also draw a crowd of loose, unskilled players; giving more the serious online poker players an opening to cash in on some nice prize pools. New players at Ladbrokes have the opportunity to earn an exclusive Labrokes sign up bonus of up to $1000 in cash using our Ladbrokes Poker bonus code: VIPBONUS. Instead of matching a percentage of the player’s deposit, Ladbrokes issues the bonus amount relative to the number of points players generate in real money online poker games. However, a minimum deposit of $10 (or any foreign currency equivalent) is required to earn up to $1000 in bonus cash. Players who qualify for the Ladbrokes sign up bonus will have 45 days from the date of their first deposit to collect enough points to earn a bonus from Ladbrokes. The bonus may be claimed at any time during the 45 day period on the Ladbrokes Poker website’s bonus information page, in the “Claim Now” section. The Ladbrokes Poker Player Club rewards players at all levels with monthly freerolls and the ability to spend their poker points on multi-table tournament and Sit and Go buy-ins, as well as merchandise available in the Ladbrokes Shop. The more points players earn each month, the greater the rewards at higher levels of the Player Club; allowing players to cash in their poker points, earn a loyalty bonus and enter freerolls with increasingly larger prize pools. At the highest tier of the Ladbrokes Poker Player Club, players achieve VIP status (10,000+ points per month), entitling them to entry into Ladbrokes Poker’s quarterly VIP freerolls, a 30% loyalty bonus, and exclusive VIP promotions with prizes ranging from electronics to live poker event prize packages. VIPs also receive personal attention from the Ladbrokes VIP managers via msn. Ladbrokes Poker presents numerous online poker promotions throughout the year, the most enticing of which are the live event prize packages that include accommodations and one or more seats in such prestigious tournaments as the World Series of Poker. Players can also earn up to a $500 reload bonus, compete in team championship tournaments, play progressive jackpot STTs and MTTs and even have a tournament named after their screen name by winning one of Ladbroke’s Who’s the Daddy guaranteed tournaments on Tuesdays and Thursdays. Customer support at Ladbrokes Poker may be reached through a variety of methods. A very convenient live chat option is available for instant help, as well as a toll free telephone number for the UK, and international phone number for the rest of the world. 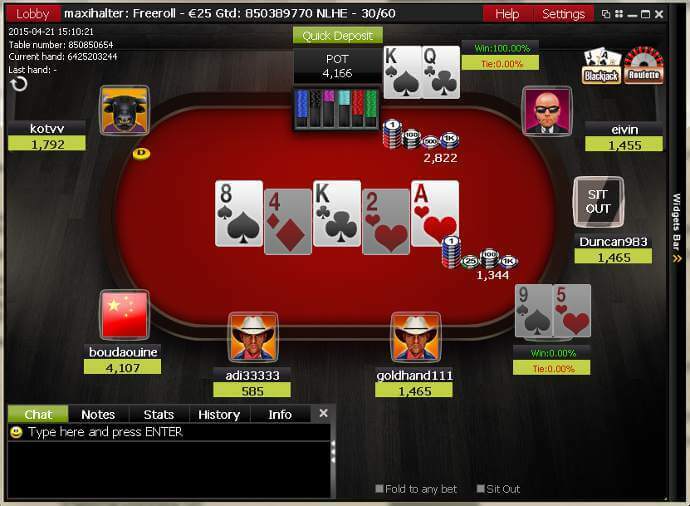 Players may also contact Ladbrokes Poker support via email. Deposits: Visa, MasterCard, Delta, Maestro, Switch, Solo, cashier check, money order, bank draft, personal check, bank wire transfers, Western Union Quick Pay, NETeller, PayPal, Ukash, eNets, Click and Buy and Moneybookers. Cashouts: Visa, MasterCard (UK only), Delta, Switch, Solo, check, Bacs, Chaps, international transfer, international bank wire, Western Union, PayPal, NETeller, Click and Buy and Moneybookers.